Home >> We’re Having A Baby! Well it’s official, Carly and I are having a baby! It’s been a while before we could make this post as we didn’t want people to find out before we let our family know and with ‘Mum Close’ being in Western Australia on holiday, that took a little longer than expected! But finally we can post about our little bub! Little juniour is now 13 weeks old. 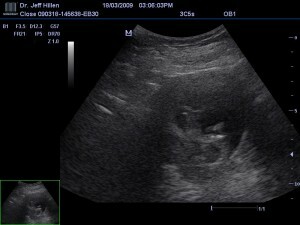 Below you can see a scan of him/her (we don’t know) at 11 weeks. A very active little one – the doctor had trouble trying to measure how long the bub was as they wouldn’t stop moving around! Though when a measurement was finally taken, bub was 5.2 cm’s all healthy and Mum (Carly) is doing just as well .